Brent Cross is a major retail facility at Brent Cross in North London that opened in 1976, owned by Hammerson and Standard Life. 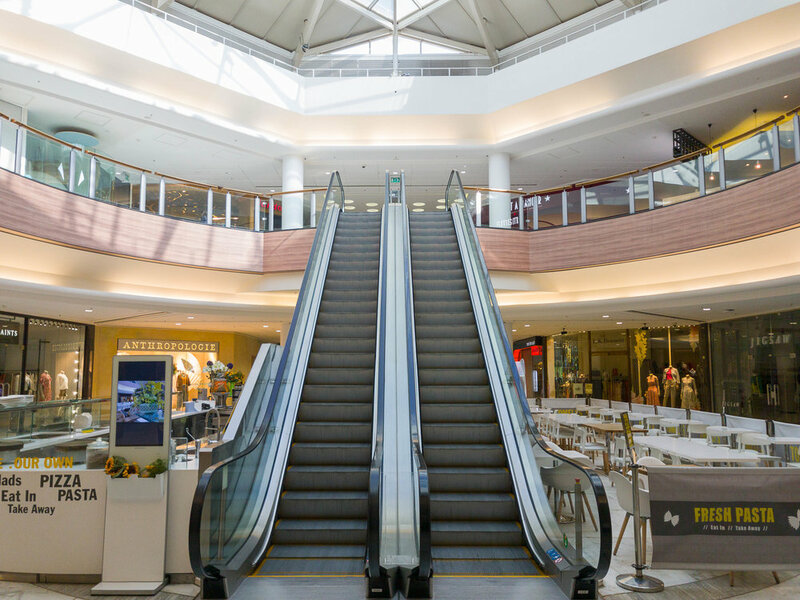 It is the flagship attraction of Brent Cross that revolutionised retail when it opened 40 years ago, with major development works in the pipeline. 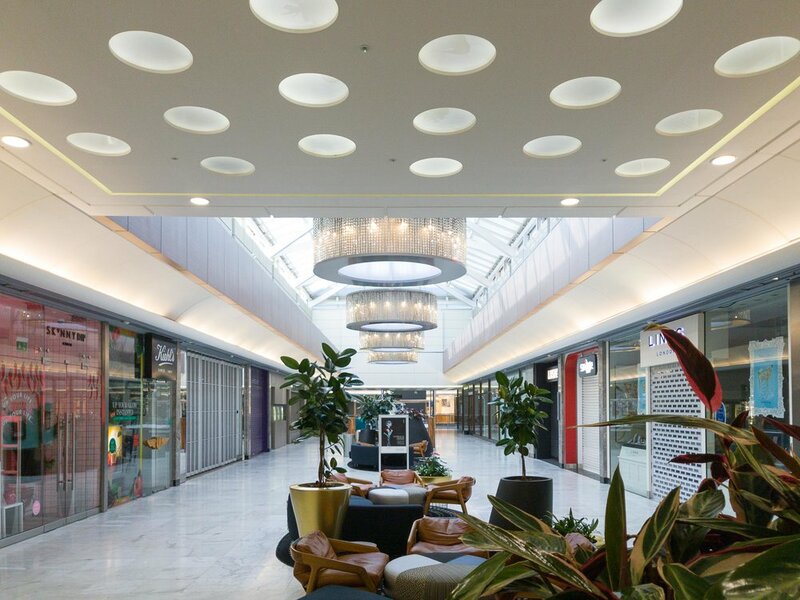 A £4.5bn regeneration plan for Brent Cross and Cricklewood is due to start in 2019 which will include new homes, public spaces such a new riverside park, enlarged and relocated bus station, 50 new restaurants, hotel accommodation and the first showcase cinema de Lux in the UK. The centre already boasts a 2 million sq. ft. of retail space with an additional 2 million sq. ft. to be added. 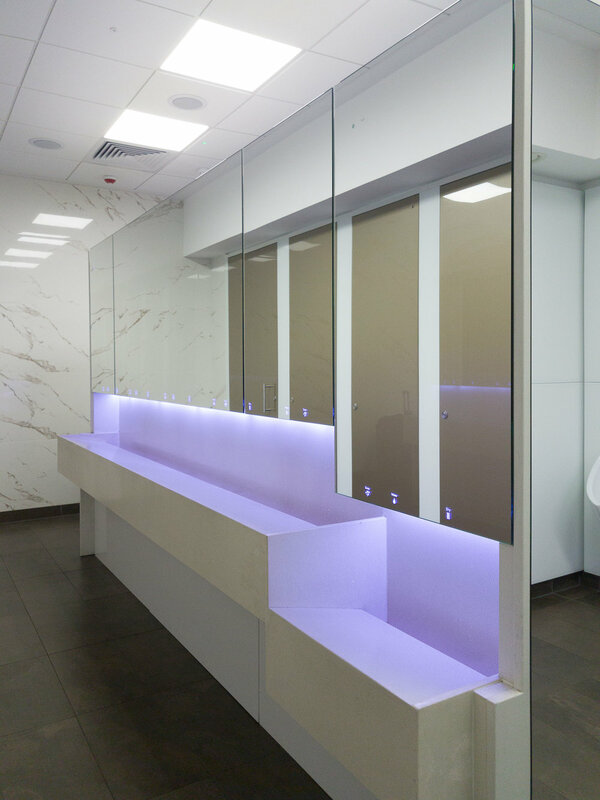 Before this new phase of development took place, they approached us to transform the washrooms in the facilities already being used for customers. The vision was to achieve inspiring spaces and a Hollywood wow factor, to tie in with the look of the new developments due to begin. 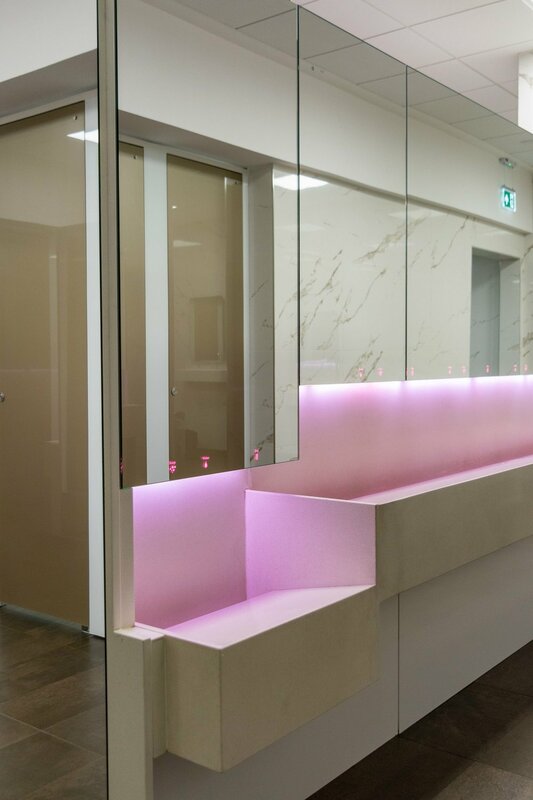 They opted for our ever-popular ALAVO wash stations, opting for blue halo lighting in the Men’s washrooms and pink in the ladies. 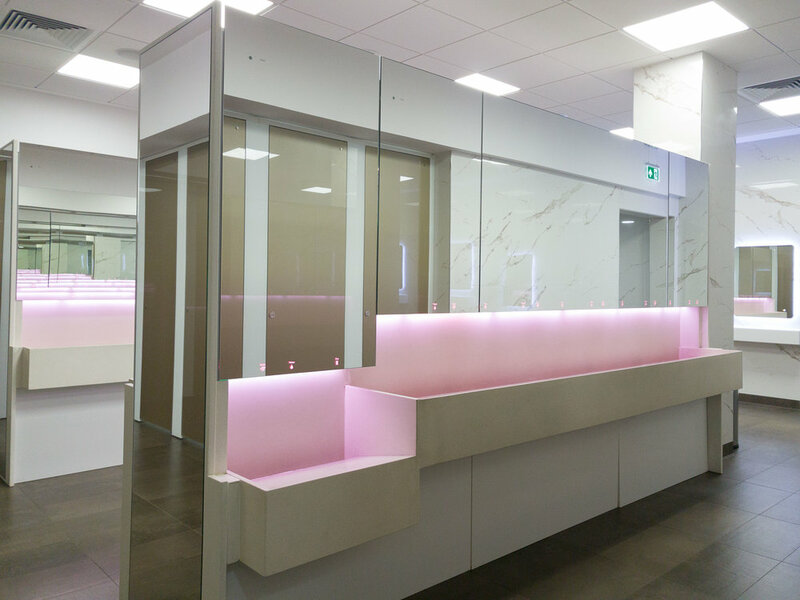 The pale yet stylish colours of the lighting reflect beautifully off of the white marble finish of the walls of the washroom. 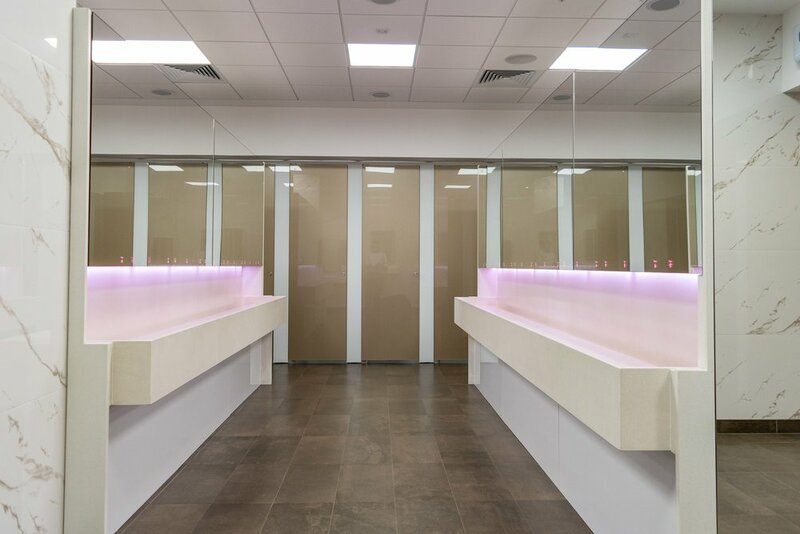 As Corian fabricators, it made sense to choose pure white Corian wash troughs to match the ALAVO wash-wall. 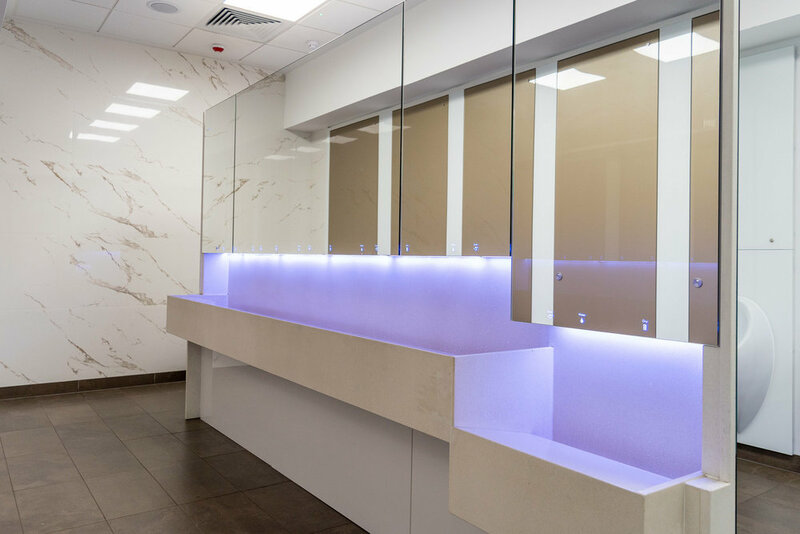 The wash trough basins ensured for clean and hygienic use as customers do not need to touch any of the washroom products in order to use them, therefore minimising risk of spreading disease and germs. By also installing rows of washstations rather than one wash wall, it helps minimise queue times so that customers who wish to spend the whole day at the retail centre do not waste valuable time queuing to use washroom facilities. As a DuPont company, we are able to ensure seamless design and installation for the client. 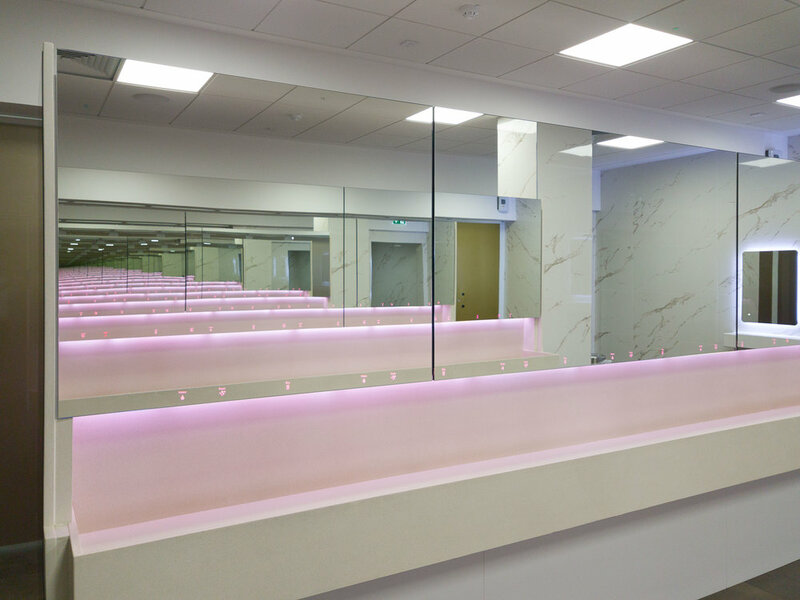 Separate mirrors with white halo lighting were installed separately to the ALAVO systems so that those only wishing to use a mirror area for ablutions etc. can do so without causing a hold up at the hand washing facilities. Shelving was also put under the mirrors so that customers can place bags, make up etc. on the shelves without having to place them on the floor. 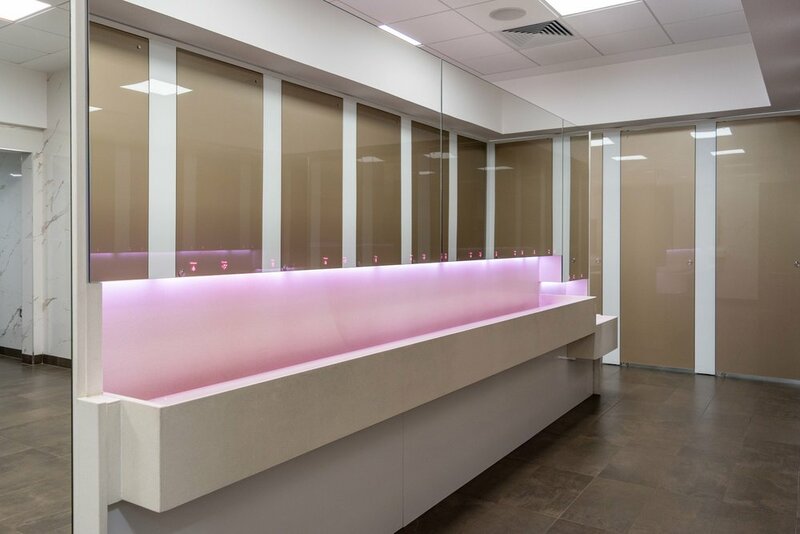 These new and dazzling washrooms certainly create an inspirational environment, where maximising on space was well designed.